I’ve taken a lot of photos on this trip so far, (you may have noticed the ones on trains for example…) and one of the things I have been keen to do is to take photos of similar things in different parts of the world, as I thought that way I could then group them together and share the best ones on this blog. One of my first ideas for this, was to take photos of the various Soviet monuments, mostly war memorials, that lie inside the countries of the old USSR or, as in Berlin, were put up in honour of those who had died in situ as it were. Some of these memorials are definitely still a focus for life. Several couples were having their photographs taken at the ones in Bishkek and Almaty. Others, like in Berlin seemed to be occupied by a young people more interested in riding their bikes around the quite park that surrounded them. I wonder if these, often rather unsubtle memorials affect the way people think of the past – when I think of war memorials in the UK, I tend to think of the cenotaph and small rather understated memorials in villages and towns. However, with the high provenance the military and military casualties have had in the 21st Century, is this now changing in the UK? I’ve not been their to see it, but the Poppy installation at the Tower of London strikes me as being very much in the mould of the emotive Soviet style memorials, particularly in the way in which people have taken to having their photos taken in front of it. Does anyone know of anyone have some Wedding shots there? There are several memorials in Berlin, in both East and West Berlin. The first, in Berlin’s Tiergarten, was built soon after the war close to the Brandenburg Gate and ended up in the British zone of control after the partition of Germany and Berlin. There is also a tank and artilary piece outside, just out of shot. 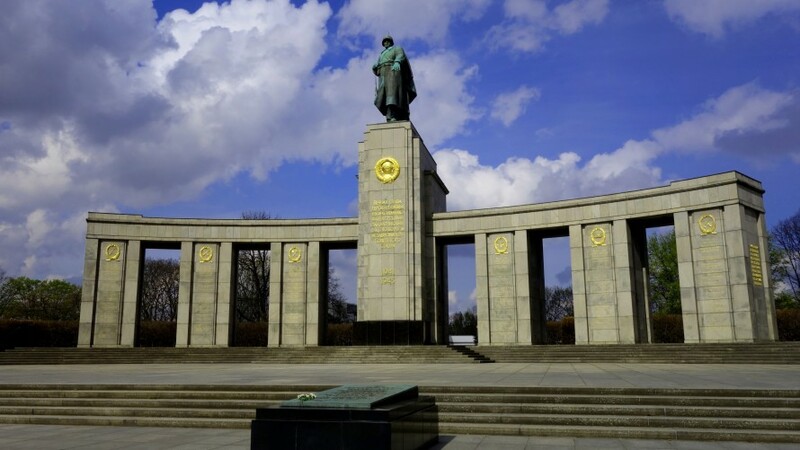 The second memorial is much larger, in a large park to the East of the city, Treptower Park. The whole park itself is a monument so I have simply chosen three shots to try to give an idea of the scale of it. There is also a visual depiction of the Nazi invasion of the USSR and the USSR’s defence and ultimately victory over the invaders running across numerous sarcophagi representing each of the USSR’s constituent states at the time together with two kneeling soldiers. A statue of a grieving mother can also be seen by the main entrance. On top a large hill overlooking the Bulgarian city of Plovdiv, this memorial was difficult to photograph as it was either to far away from me, or so close that getting a good angle was impossible. Made of blocks of stone it clearly looks much “cheaper” than the cast memorials seen elsewhere. The commanding view over the whole of the town below seems similar to the memorial built by the Soviets at Budapest. This memorial still stands in Budapest on Gellért Hill,, overlooking the city like the memorial in Plovdiv. It remains despite many other communist era statues having been taken down, (you can see a collection of them now residing in the rather bizarre, “Statue Park” a bus ride out of central Budapest.) The reason being that unlike some other Soviet era memorials it isn’t particularly militaristic, (for one thing it’s not just a giant soldier) and its design made it possible to adapt it to the new political climate with a slight tweak to the inscription – It no longer praises Soviet liberators, but instead all who have fought and died for an independent Hungary. Aktau’s war memorial looks completely different to those found in Europe, and is instead part of a design tradition found across the Central Asian Soviet states. The design, around an eternal flame seems to conjure up the image of the traditional nomadic yurts. It’s definitely a place for reflection much more in-line with the war memorials I am used to seeing in the UK and at the mass cemeteries of WWI in Flanders. I photographed another monument at Aktau, and thought I would add it here despite it not really fitting in with the other war memorials I’ve put up. It is a MiG Fighter jet mounted on a plinth. Several other these are visible in ex-states of the USSR, remnants of the countries once vast Cold War airforce. I have seen old military planes mounted on plinths in the UK to, but generally only outside Royal Air Force bases where they are known as “gate guards.” I wonder what people would think if we started sticking retired Tornado Jets in town centres or on roundabouts? The war memorial in Tashkent is different to the other central Asian memorials but still retains its mood of sombre reflection. The globe, highlighting the USSR above the mother and child also makes for striking photos against a blue sky! Another memorial that I spotted, was to honour the victims of the earthquake that struck Tashkent, destroying many of its buildings and leaving many homeless in 1966, as well as honouring those men and women from the rest of the Soviet Union who helped rebuild the city. Last up for now, is this memorial in Bishkek. In the same style, but rather larger than the one found in Aktau, it too appeared to be seen as an ideal wedding photo location. I’m not sure what feels more alien from a UK perspective – the photographs in front of the memorial or the photos I saw being taken in Hong Kong of the happy couple in a railway museum! So that’s it for now, hopefully I will be able to post a Part 2 someday! Really interesting stuff. Nicely photographed too. Look forward to seeing part 2! Thanks! Hopefully part 2 will come some day!